I can't stand that cartoon picture I put up in my last post, "Don't Be Ugly", so I need to post something else ASAP (so when I go to my blog that ugly girl isn't the first thing I see). Ah, now I have something much better to see. Or someones, I should say. I think they played for over an hour and a half with it. 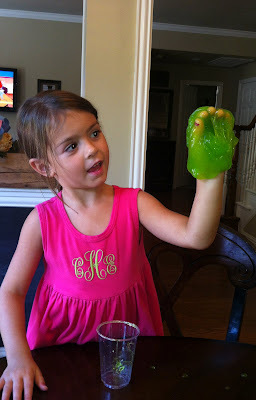 I was very impressed with the slime (it doesn't stain or stick to clothes, or bodies) and it is so fun-worthy). I have three more pictures of cute little ones. That's Jack (the bank's auditor's son) and Mac, our nephew. That's his gorgeous mom, Lorie, my sister-in-law. Anyway, I've not seen any ugly people lately, thankfully. All have been cute.... and beautiful.